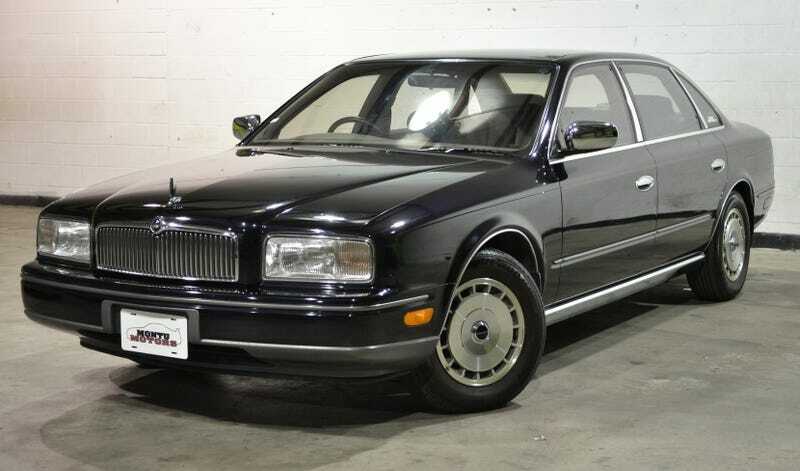 If you were one of those kids in high school who couldn’t get enough of Mock United Nations Day, or you’re just like me and can’t get enough 1990s aesthetic in your life because yes, you are simple and predictable and trendy, then this 1990 Nissan President Sovereign is perfect for you. Listed on Bring A Trailer with no reserve, you’ve got until Inauguration Day to buy yourself a very diplomatic-looking, long-wheelbase Infiniti Q45 rebranded as a Nissan President. According to the listing, this President is experienced but not tired, worthy of the name with only around 25,000 miles and commanding the road with a 4.5-liter DOHC V8 and a four-speed auto. The President comes with a TV and climate control in the back and overall the interior seems sound, with a very stately exterior paint job literally called Dark Bluish Black Pearl. It has a Florida title thanks to the 25-year import law, and comes with extensive Japanese service records. Automotive forums have a lot of talk about trouble with the fuel injectors on the President and its Infiniti counterpart, but it’s practically guaranteed there’s no other power trip quite like running your life from the President’s seat. Checkout the listing over at Bring A Trailer. Why Not An Infiniti Q45? Who The Hell Kept A 1981 Chevy Impala With Only 31,000 Miles On It?